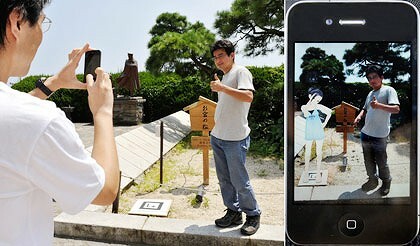 Left: A man stands next to a tiny black and white panel to have his picture taken and displayed including the animated image of a girl through (right) an iPhone application. Long a favourite of lovers and honeymooners, a Japanese beach town with fading sparkle has found a new tourism niche in the wired age by drawing young men and their virtual girlfriends. Rinko may only be digital, but try telling that to Watanabe or the legions of other fans of "Love Plus", a dating sim or simulation game that is played on handheld Nintendo DS consoles and also boasts AR applications for iPhones. Its creators, Konami Digital Entertainment, have long thrilled young men obsessed with high-tech, manga and anime, known as "otaku", by letting them chase virtual girls in the alternative universe of their digital dreams. The hit videogame made headlines when a 27-year-old Japanese man known only as "Sal 9000" staged a tuxedo wedding late last year, which was watched by thousands online, with his favourite cartoon girl, Nene Anegasaki. But in the latest edition, game makers have gone a step further and teamed up with the very real city of Atami, an onsen or hot spring town 100 kilometres (60 miles) southwest of the Japanese capital. They have selected 13 romantic locations which can be overlaid with images of Rinko or her teenage friends Manaka and Nene, who have all swapped their usual sailor-style school uniforms for casual summer wear. Local souvenir shops in the resort town have caught on and capitalised on the love-struck new clientele, selling Love Plus-themed souvenirs, from good-luck charms to steamed buns and fish sausages. The local Ohnoya hotel even offers traditional rooms to the unusual couples, which feature two sets of futon beds and another barcode panel that allows the men to visualise their girlfriends in a flattering summer kimono. Love Plus, released only on the Japanese market, has become the country's most popular dating game since its release last September, selling nearly 430,000 copies, according to research firm Enterbrain. The secret is that the dating game goes a step beyond the genre's usual boy-meets-girl script and asks players to build long-term relationships. "In conventional love games, you went up stages to make a virtual girl fall in love with you, so that she would accept you as a boyfriend or express her love for you," said Konami spokesman Kunio Ishihara. "But players of Love Plus are in a scenario where they are a high school boy who is already dating one of the virtual girls. The goal is to see how good you can be to her and to build a relationship." Love Plus is an open-ended "communication game" with basic voice recognition software and a screen clock that keeps real time to make players feel like they are really sharing their life with a girlfriend, Ishihara said. That means that the girl can get moody when neglected by a player who is not sufficiently committed, and that she demands attention when she feels unwell. If players want to go on a summer trip with their girlfriends, they have to convince her and plan ahead through virtual communication, Ishihara said. The fans milling about town clearly enjoyed the challenge. "With earlier love simulation games, we only scored girls, as bad as that sounds, and that was it," said Naoyuki Sakazaki, aged in his 40s, after taking iPhone shots before the bronze statue in Atami. "Love Plus is fun because the relationship continues forever." The popularity of Love Plus has been a welcome shot in the arm for Atami, which has seen visitors decline some 40 percent since its 1970s heyday. More than 200 Love Plus fans have stayed at the Ohnoya hotel alone, while well over 2,000 have visited the resort town for the campaign, which kicked off on July 10 and runs until the end of August. Young men have come from as far as South Korea and Taiwan, say locals. Atami's business association was at first hesitant and puzzled by the story line, in which a high school girl spends a night at a resort hotel with a man. "Some people were opposed to taking part in this campaign, saying the game is immoral," said association member Saiki Ota. "We also didn't expect it would sell that much." But they eventually realised the economic impact of the project, he added. Konami's Ishihara stressed that the game has no sexual content. "The virtual girls can kiss you as a way of communication, but nothing happens when she sleeps next to you at the hotel," he said. "We have no intention of trying to sell a product with pornographic elements. "I think Love Plus fans would get offended if somebody tried to disrespect his girlfriend like that."